To date, I've built 7 ring lights, and yes, I confess: it has turned into an obsession . But no longer. My latest finished projects, version 4.0 and 4.1, are awe-inspiring, if I may say so. The funny thing is, they're also the cheapest to build. I recommend skipping all previous versions completely and head straight to Ring light 4.0 or Ring light 4.1. However, the latter is most likely not something you will be able to do yourself, because it relies on a special optic fiber assembly from an electronic traffic sign. If you want to build a fiber optic ring flash, your best bet is the 4.0 version, and then take the bracket mount from the 4.1 version. A proper ring light (TTL flash) will run me over €300, that's about 4 times the money I spent on all of mine, and about the same amount as a top-of-the-line hotshoe flash. There is a commercial product that works like my 4.0 and 4.1 versions, but it's over €200, and you still need a hotshoe flash for it. The whole setup is even more freakishly large than my contraptions. 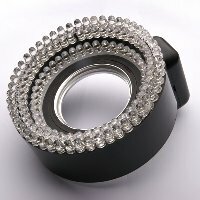 Most lights advertised as ring lights simply aren't. They have 2 sideways light sources or 4 tubes in a square arrangement. 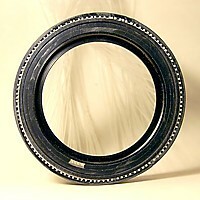 Mine are real ring lights, except the 3.0 and 3.1, which aren't full circle (but still very close to full circle). Many ring lights are continuous lights. They're as useless as my own ring light 1.0, and don't allow you to get any depth of field and useful shutter speeds at the same time. I can shoot handheld at f/36 with the 4.1 ringlight. 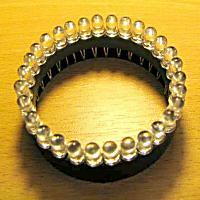 Try that with LEDs. Below you'll find a time reversed overview. For example photos taken with the 2.1 ringlight, please refer to the objects section at Fuzzphoto.eu, my photography department. Photo number 1, 3, 4 and 5 are taken with this ringlight, as well as the spider in the animals section. There are some examples and test shots on the respective project pages as well, and lastly, there's a special Ring light test shots page, to which I still need to add a lot. Bear with me on this. Extreme close-ups are not my main subject. Ring light 4.1 is an all-new, more practical approach to the fiber optic TTL ring flash idea. Again, it's nothing more than a light guide. But this time, long, super fine fibers are used, resulting in a much more flexible setup, making it possible to use the ring on nearly every lens, even huge macro setups. Ring light 4.0 is nothing more than a light guide, really. 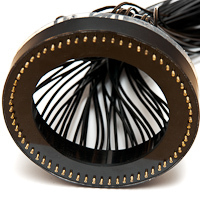 120 acrylic optic fibers guide the light from the camera's popup TTL flash to a 72 mm filter thread ring. Essentially a very simple idea, with cheap materials, that blows away any continuous ring light in terms of cost, weight, light output, color temperature and ease of use. Ring light 3.1. Intended for a different lens, with a different reflector. Unfortunately the project had to be put in the freezer, because the CCFL tubes were a bit more fragile than I anticipated. 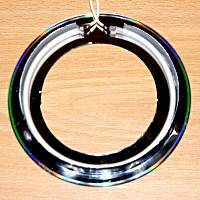 Ring light 3.0 was a failed attempt to use circular CCFL tubes. The CCFLs are very nice, but the reflector didn't do a good enough job to let this ring outperform version 2.1. 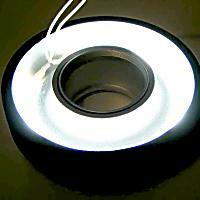 Then came Ring light 2.1: the ultimate LED ring light. 140 of those little buggers providing 12 Watts of bright white light. 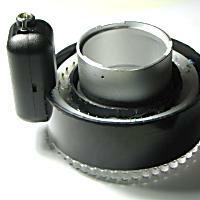 Of the LED ring lights, this is the one in use today. Ring light 2.0 was a big step up from the previous version. Triple the number of LEDs, a generic mount and an attached power supply. It all started with Ring light 1.0. I was just fooling around with some LEDs, didn't want to spend a lot of time on it, and this was the result. I did spend quite some time on the power supply, from which later versions would benefit a lot. Peter Danninger receives my gratitude, as this is the project that started it all for me. The author doesn't seem to be very active anymore. Jens Birch got me thinking about optical fibers, so thanks to him for the original idea.